We've arranged to meet in a gravel car park at the foot of Mt Majura, a darkening wedge above us in the dusk. My daughter and I wait in the car. It's winter. A woman passes along the nearby pavement, guiding her way by torchlight. Canberra's streets are kept dim, I learned recently, for the sake of astronomers at nearby Mt Stromlo observatory. In the decade I've lived here, I've had an ambivalent relationship with Canberra, but the idea of a city that strikes bargains with stargazing scientists to restrict light pollution leaking skyward is endearing. There are other endearing things. One of them is the amount of bushland interspersed throughout the urban landscape. You can be in the middle of suburbia one minute and bushwalking on nearby Black Mountain, Mt Majura or Mt Ainslie ten minutes later. This kind of mixed landscape is ideal for the citizen science project we're about to launch into this evening, as soon as the co-ordinator of the ACT and Region Frogwatch Program, Anke Maria Hoefer, arrives for our first training session. The program runs a community-based annual Frog Census framed against a rapid global decline in frog numbers over the past four decades and the extinction of many frog species. 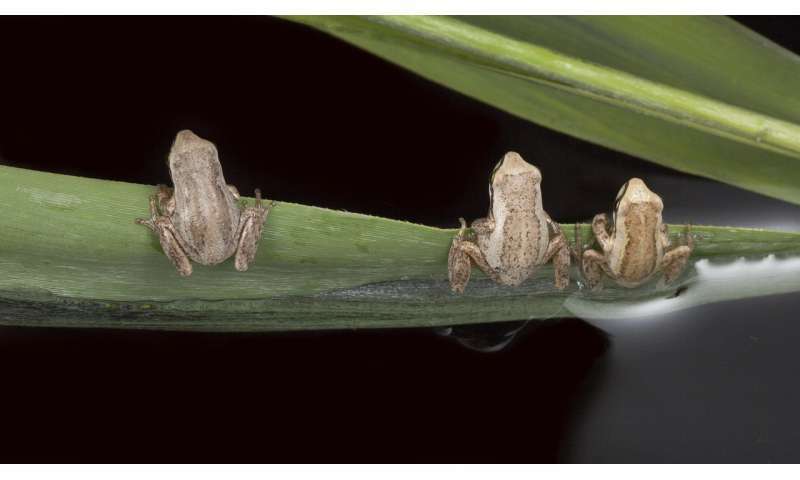 The census began in 2002, and the resulting long-term dataset on the abundance and distribution of local frogs has enabled additional research activities including a climate change project. We'll take part in the latter, which monitors behavioural shifts in frogs through recording their calls at particular sites each week from June until October. We're here for a few reasons. One is to get a lived sense of climate change in our immediate urban surroundings. Plus, I want to make a contribution, however small, to the huge dilemma of climate change and its impacts; give my 13-year-old daughter a taste of scientific fieldwork in case it appeals to her; get to know our local surroundings better; and, as a writer, to think about practices that don't simply observe or contemplate place but also participate in constructive activities at those same locales. Numerous commentators have observed that the vast and intangible scale of climate change may be an impediment to more people taking action over our warming atmosphere. We know through the science that climate is shaped by the working of the entire planetary system – the earth's interactive ocean, atmosphere, land and ice systems all linked to human activity. Depending on where you live, (but not in the Pacific Islands, the deltas of Bangladesh, Arctic Canada, or drought-stricken rural Australia), its impacts can seem far-removed from our own lives and the places we know best and care most about. With care, often, comes action. What can seem an amorphous, far-fetched threat is brought closer to home through studies such as Frogwatch. The project studies the impact of climate change on phenology, or seasonal behaviour. Most frogs only call during the mating season, which is triggered by temperature and rainfall. Different species mate at different times and volunteers record the onset of mating calls from winter breeders (whistling tree frog and common eastern froglet), early and mid-spring breeders (spotted grass frog, plains froglet, striped marsh frog and smooth toadlet), and late spring to summer breeders (eastern banjo frog and Peron's tree frog). Frogs are known as an "indicator species" for water quality and local ecosystem health. With their permeable, membranous skin, through which respiratory gases and water can pass, and their shell-less eggs laid in water, they are sensitive to even low concentrations of pollutants in water and soils. In this study, frogs give a different kind of warning – as they begin calling earlier in the season, they reveal and give voice to the warming climate we now all inhabit. 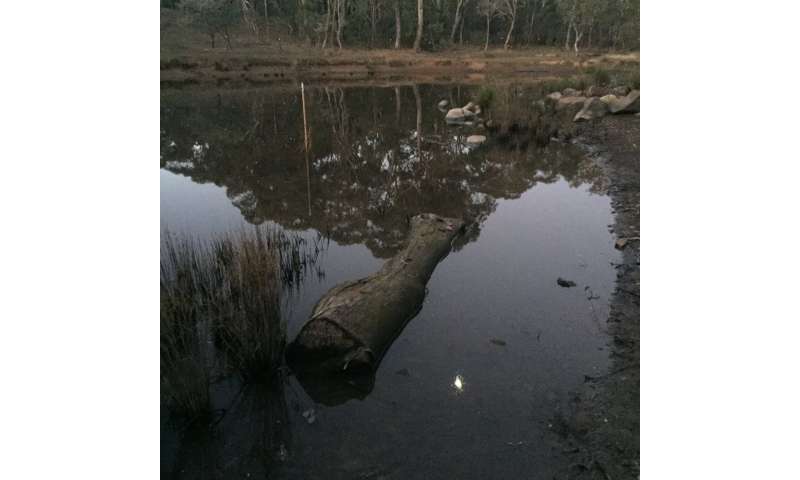 The project is fortunate enough to be able to build upon weekly counts of calling frogs by ecologist Will Osborne during the 1980s and 1990s in the Canberra region. Effects of climate change can be incremental. They can also be non-linear, as scientist Pep Canadell explained to me in a recent interview. "Climate change expresses itself through extremes. It's not a linear relationship of impacts," he said. This mixture of incremental change and unpredictable "expressions" can be difficult to record in the short term. With this in mind, the Frogwatch project builds on Osborne's historical data along with the Frog Census data to chart changing trends. A preliminary comparison reveals that the breeding season of some local frog species might be commencing up to six weeks earlier than 40 years ago. Headlights sweep into the car park and Anke Maria arrives with a visiting German student who is also researching frogs. Anke Maria is a whirlwind of talk and activity, honing in on my daughter as we zip our down jackets, pull on beanies and gloves, switch on torches and head up a gravel fire trail toward the first dam, known as FMC200. Only metres later we stop at the base of a narrow drainage gully. It's been a dry winter, but with a patch of recent rainfall a miniature sump-like drainage area at the base of the gully is alive with frog calls. "That's Crinia signifera," Anke Maria explains, making what seems a perfect imitation of its repetitive call. "How would you describe it?" she asks. My daughter turns to me. The call is repetitive, creaking. We struggle to think of descriptions. It's like trying to put a flavour into words. "Who do you think is calling? The male or female?" Anke Maria asks. My daughter pauses, pondering. "The female," she hazards a guess. "Good try," says Anke Maria, "but only the male frog calls. Except when the female makes a warning call." She imitates this staccato warning sound. "And why do you think the males are calling?" Again my daughter pauses to consider. "They could be hungry or they found food," my daughter replies. "Good thinking, but they're calling to attract a girlfriend. And do you know, scientists think that each frog species can only hear the calls of their own species. It's like tuning into a radio station. There are many different stations, but we can only tune into one at a time. A female whistling tree frog can only hear a male whistling tree frog, a female corroboree frog can only hear a male corroboree frog." They recognise the frequency and intensity or pitch of the call, she explains, and also the pattern of the call or its pulse structure. "This helps the female find a mate from their own species and not get confused by other frogs." We ponder this sonic world where one species can be deaf to another, turn left down a narrow walking track, torchlight bobbing along with our footsteps, illuminating tussocks of grass, fallen branches, shrubs, stones, until we reach the dam. "This is for you," Anke Maria passes a thermometer. "You do it," she tells my daughter. First we record the ambient temperature then my daughter squats at the edge of the water, waving the thermometer gently through the shallows. We note the weather: light cloud cover, low breeze. We estimate the dam's surface area and depth. Then our small group falls silent as Anke Maria switches on her phone audio-recorder. For three minutes we hold still and listen. There's the low hum of the city below, an ambulance siren swells and recedes, distant traffic, the shuffle of our down jackets as we try not to move, someone sniffs in the chill winter air – and the frogs. You can hear them interspersed across space, some close, some farther away, among vegetation rather than water. Because of Anke Maria's explanation, I understand now these are not call-and-response sounds. They are invitations, serenades, statements of presence, lures. Sometimes the calls come in a cluster, other times at staggered unpredictable intervals. There are at least two species here, I guess. In the distance, a mopoke calls. When Anke Maria switches off her phone, we relax into movement again. As we walk towards FMC210, our second dam, she tells us we've just heard a whistling tree frog (Litoria verreauxii). "How would you describe his call?" Anke Maria asks. My daughter decides on a stick dragged across a rough, hollow surface. Anke Maria makes the call. Her imitations are pitch perfect, an art form. She will be the one who checks the recordings that non-specialist volunteers send in weekly, uploaded to the Frogwatch website. We will make our guesses at species we've heard, but she will verify with her trained ear, a labour-intensive task. A week later, on our first trip into the dark alone, the evening is silvered and rigid with frost, as if everything is held together in some different, more metallic way. It's three below zero and falling. Our breath steams, our boots crunch, the bush is still. I sense something in a dead tree ahead before I see it, a tawny frogmouth, grey, motionless, an outcropping like a broken limb. We pause several steps away and it regards us, head half swivelled, a little tuft of feathers at the base of its beak. The following week, on our descent from the dams, once again a frogmouth is in the same tree. A second bird perches a few metres away. They are bound together in some mute, still business. They survey us. We move on with subdued steps. Beyond the birds, the first row of suburban houses begins. We thread our way back to the car with a sense of secrecy and adventure, past back fences, patches of bright window, catching fugitive glimpses of other people's lives through a half-open door, a crack in a curtain, the blue flicker of TV light. It might show that an early spring breeder is shifting its season into winter. This minor-sounding alteration has a cascade of flow-on effects. Frogs stagger breeding seasons, giving each species its portion of acoustic space to call, breed, then when eggs hatch into tadpoles to feed (a mode of "time sharing" water and its resources). If seasons shift, merge and overlap, competition for resources intensifies, and survival can be jeopardised. But this year it's a cold, dry winter. This telling species, Crinia parinsignifera, is calling two weeks later than last year (when it called early). Meanwhile northern Australia is experiencing its warmest July on record. Non-linear. As the monitoring season progresses, dam levels drop. By the end of October, waters have fallen almost silent. Will Osborne sends an email around, explaining that cold nights and low water levels will make it hard to interpret this season's counts. "Most species feel insecure about going out onto that exposed mud and trying to find a call site or searching for mates! It will be a big rush when the weather warms and we get good rains – the calling sequence could be condensed this year which will be interesting…"
Many volunteers join Frogwatch because they want to participate in a hands-on, climate change-related study with real life applications. "They highly value the opportunity to be involved in climate change actions," Anke Maria says. She captures one of the dilemmas of our times. Many people want to take action but are unsure how. As artist Natalie Jeremijenko observed): "What the climate crisis has revealed to us is a secondary, more insidious and more pervasive crisis, which is the crisis of agency, which is what to do." Citizen science gives volunteers an opportunity to do something. Studies that chart the impacts of climate change here-and-now disrupt the assumption that effects will occur in a distant future or at some remote geographic location (melting ice caps, apocalyptic cities under 20 metres of water). Instead, they start to build a picture of measurable effects experienced at the current level of 1°C warming above pre-industrial levels – let alone at 2°C or above, which is what we're committing to based on current emissions rates. In the Canberra region alone, studies are being conducted into impacts of global warming on urban lizard species (who reside next to the local DFO) and alpine pygmy possums. At a broader scale, Pep Canadell has observed major ecological transformation in Australia that occurred with a 1.2°C increase during the last El Niño. He calls the El Niños a "window into the future because they bring all this heat and put the world where it may be in 30 or 20 years' time." In the last big El Niño of 2015-16, this "future now" included the well-known bleaching of the coral reef, and fires in the moist peats of alpine Tasmania. There are no records for the past 8,000 years that there has ever been a fire in this part of the world. In addition to these well publicised events, around 700 km of mangroves lining the Gulf of Carpentaria died in a month; and the Murray Darling River had one of its worst algal blooms caused by an algae that belonged not in this region but to hotter places in Queensland. "These ecological signs are unprecedented, all in this little window of a warmer world that the El Niño brought for us," said Canadell during our interview. He went on to list even more signs. "For some reason these things don't go through the media enough because of … whatever," he added. Unfortunately, just as I completed this article, the Frogwatch Program discovered that its funding from the ACT Government was not renewed in the 2018–19 budget. Without core funding, the organisation and its annual Frog Census will cease. The enthusiasm of volunteers will help to collect another season's data for the climate change study but it too is under serious threat unless alternative funding can be sourced. When our monitoring season finished last year, I asked my daughter whether she wanted to do it again. "Yes," she replied without hesitation. "What did you like most about it?" I asked. "I don't know," she said, "it was just fun." And so, as Canberra's heavy frosts set in, we have begun again, treading up towards FMC200, waiting for frog calls to begin.